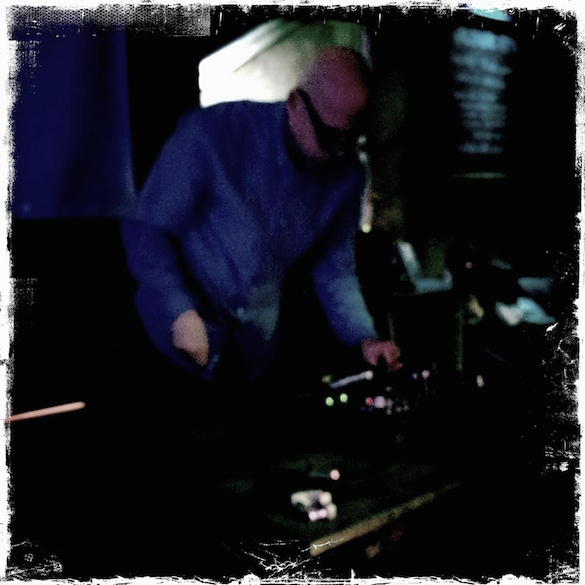 BJ Nilsen (SE) is a composer and sound artist based in Amsterdam. His work primarily focuses on the sounds of nature and how they affect humans. Recent work has explored the urban acoustic realm and industrial geography in the Arctic region of Norway and Russia. Nilsen’s original scores and soundtracks have featured in theater, dance performances and film, in collaborations with Chris Watson, Jóhann Jóhannsson, Stilluppsteypa and others. He co-edited the book+CD publication The Acoustic City (2014), published by jovis. His solo albums Eye Of The Microphone (2013) and The Invisible City (2010) were released by Touch. In 2014, Nilsen collaborated with filmmaker Karl Lemieux on the audiovisual work unearthed, which was presented along with the Sonic Acts publication The Geologic Imagination. In 2017 Editions Mego released Massif Trophies – An exploration of the alpine soundscape. Moving Furniture Records is a label based in Amsterdam, The Netherlands specialized in releasing experimental electronic run by Sietse van Erve, started in October 2008. We are mostly interested in drones, minimalist, microtonal and field- recordings music. Moving Furniture Records has released music by both renowned, musicians such as Frans de Waard, Gareth Davis & Merzbow and Machinefabriek, as (young) new talent such as Find Hope In Darkness, Rose & Sandy and Haarvöl. Moving Furniture Records also organizes concerts in various venues in Amsterdam incl. DE RUIMTE, STEIM and OCCII. For one day only, visitors will be able to see The Broad’s vast, column-free third-floor gallery in its raw state, before the art walls are put in place for the museum’s opening on Sept. 20, 2015. Two light and sound works will interact with key features in Diller Scofidio + Renfro’s (DS+R) innovative architecture. Sky-lit: Volume, Light, and Sound at The Broad will highlight the relationship between the museum’s architecture and its urban environment. Artist BJ Nilsen’s sound installation, DTLA, is an abstract audio landscape of downtown Los Angeles. Just as The Broad’s porous architectural “veil” subtly interweaves natural light and glimpses of the urban streetscape of Grand Avenue into its galleries, Nilsen will bring the soundscape of downtown Los Angeles into The Broad. Stillness, by artist Yann Novak, will be activated after dark, creating an immersive sound and light environment for reflection, inviting visitors to contemplate the effect of climate and light on their physical and emotional states. BJ Nilsen´s DTLA, is a 16-channel auditory collage of downtown Los Angeles consisting of recorded sound events in and around Grand Avenue, Chinatown, the L.A. River, Olvera Street, Little Tokyo, the Fashion District, Skid Row, Bunker Hill, the Financial District, Echo Park, Union Station, MOCA, the Colburn School and the LA Opera. Based on the original score for the film “I Am Here” (due to be released in 2015), written and directed by Anders Morgenthaler, starring Kim Basinger, Jordan Prentice and Sebastian Schipper. All music written and produced by Jóhann Jóhannsson and BJ Nilsen. This is the first collaboration between Jóhann Jóhannsson and BJ Nilsen… very much a mix between their two worlds (you can hear both their signatures) and with the help of additional musicians, including Hildur Guðnadóttir on cello and the remarkable voices of Elfa Margrét Ingvadóttir and Guðmundur Vignir Karlsson, they together create a world of great beauty and mystery. We are happy to present the entire out of print Hazard and BJ Nilsen releases, spanning 16 years of activity on both Ash International and Touch. It also includes compilation tracks and live material. On the 16th of September, we warmly welcome you to Dalston’s finest, Café Oto, for our fifth birthday concert, ‘The Tapeworm’s Bunch of Fives’. CM von Hausswolff, Osman Arabi and Autodigest are flying in from far-flung places, especially for you. Andrew Poppy will finger the ivories; our interim minstrel Zerocrop will sing for you a lullaby or two; straight outta Croydon, Messrs Cornish and Julian will début a duet set. Surprise guests? To celebrate The Tapeworm’s fifth anniverary, the one and only Savage Pencil has dreamed up a new white-on-black T-shirt. This is available to pre-order now in the TouchShop, in five sizes. CM von Hausswolff delivers ‘Dark 80ies’, a select selection of archive reels featuring the likes of Zbigniew Karkowski and Phauss. 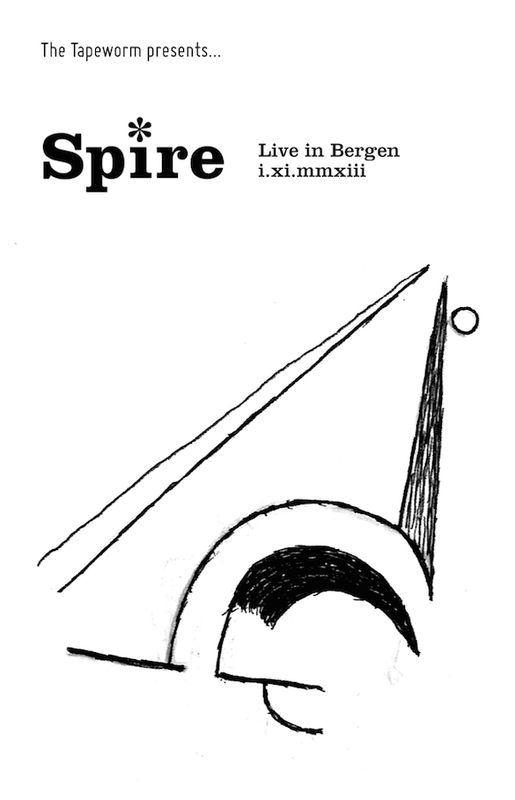 ‘Spire: Live in Bergen’ was recorded last year in a Norwegian church – Bach, Scelsci and Pärt rubbing up against BJNilsen and the Spire Ensemble. Both out now. The fifth way: Two new Bookwork books! Featuring BJNilsen & John Beaumont’s Black Death, a new project using voice (tenor) and electronics; Charles Matthews’s repertoire includes a of organ pieces by Arvo Pärt, Giacinto Scelsi and Johan Sebastian Bach; Marcus Davidson’s Ananta is released for the first time, and Spire regulars The Eternal Chord and The Spire Ensemble also perform. 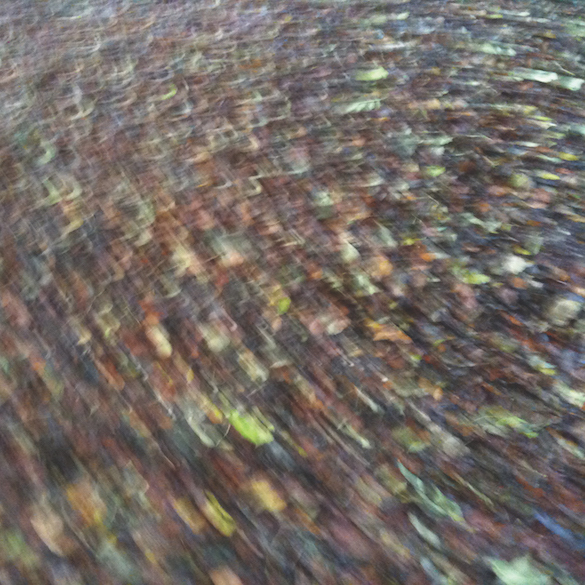 Recorded on 1.11.13 as part of Bergen Kirkeautunnale 2013, with thanks to Kjetil Almenning and Møyfrid Fuglestad. Published by Touch Music [MCPS] except – A2: Editions Salabert/G Ricordi & Co.; B4: Universal Edition. Illustration – Art I Cho. This cassette is an aspiring product of The Tapeworm – “give the peasants champagne and they still want dirty water” TTW#70, copyright 2014 The Tapeworm. The Acoustic City consists of a series of cutting-edge essays on sound and the city accompanied by a specially commissioned CD. The book comprises five thematic sections: urban soundscapes with an emphasis on the distinctiveness of the urban acoustic realm; acoustic flânerie and the recording of sonic environments; sound cultures arising from specific associations between music, place, and sound; acoustic ecologies including relationships between architecture, sound, and urban design; and the politics of noise extending to different instances of anxiety or conflict over sound. This innovative essay collection will be of interest to a wide range of disciplines including architecture, cultural studies, geography, musicology, and urban sociology. BJ Nilsen (b,1975 Sweden) Is a sound and recording artist. His work is based on the sound of nature and its effect on humans. He primarily uses field recordings and electronic composition as a working method. He has worked for film, television, theatre, dance and as sound designer. 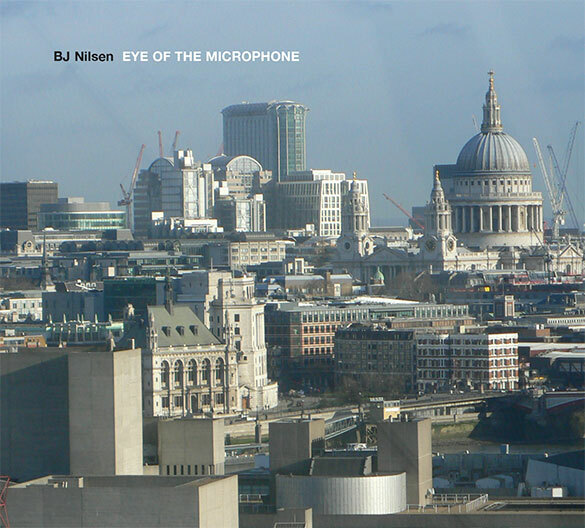 His newest album presented here is “Eye Of The Microphone” [Touch # TO:95, 2013] – a somewhat surreal audio rendition of the sounds of The City of London. Currently also working on The Acoustic City, a book publication with CD, co-edited with Matthew Gandy, [2014, JOVIS Verlag, Berlin]. In 2012 I received a scholarship from the Leverhulme Trust for a one-year Artist in Residency at the UCL Urban Laboratory in London, to introduce sound as an art practice to urban scholars and students. As part of my research I decided to dérive the city. I spent full days and sometimes nights sweeping the streets and its interiors for sound – walking and listening with no route or intention. A city without sound does not exist. Every location, passageway, alley, road, park, and pub contains its own world of isolated sound events and patterns – the sound of a shopping bag caught by the wind on the asphalt of a busy street when a bus passes by. What seems to be merely a bus is also a cacophony of sounds, a sound world in itself: hydraulics, breaks, interior noise, honking, public announcements, humans, rolling bottles, cell phones, mp3 players. The rattle of an air-conditioning unit in an old pub toilet gradually develops its broken down sound over many years, creating a raga for it own demise. Nobody seems to hear it. Is it there? The choice of sound varies; it’s a personal selection, some sounds made it into this composition, many hours of recording didn’t. Sound composition can alter space and time and transform a specific location and experience into an imaginary world. Standing on Francis Street behind Victoria Station, it is a sunny spring afternoon and the air is crisp. For a location so central it is a quiet street, for about ten seconds… As the bells of a nearby church in the Diocese Of Westminster start to chime I press record. They merge into a vehicle and then into a woman on a bike, and as she breaks to make a turn, in the distance a cellphone rings. All the time a train engine has been idle. London pulls you towards water. You are bound to reach the river at some point. On a grey and foggy afternoon, I reached the bank of the Thames during low tide. There, the sand, algae, mud, and brick buildings isolated the acoustics revealing great detail. An almost interior space, surrounded by old shoes, pieces of porcelain, half a chair, bones, bricks, wood structures, and washed up electronics, it felt like looking into the future as well as the past. To the left there were the distant smudged out towers of Canary Wharf, and to the right Tower Bridge completely shrouded in fog. The drones of the clippers on the river suddenly sounded electronic, the occasional vague beep of metal detectors belonging to coin hunters tracing our past. A chainsaw starts up from one of the workshops nearby. Back in the studio, listening, a surreal city begins to unfold. Without the multi-sensory impressions and visual synchronisation at the very present moment of recording, certain memories and perceptions seem to grow stronger. Maybe a pure field recording is not the most accurate representation of a place. Where does the city begin? We took the East Anglia Line from London Liverpool Street only a 30 minute ride away and we arrived at Cheshunt Station and stepped into Lee Valley. It is a vast area of water, grass, reed bed, and woodlands, and lots of wildlife. The weather is perfect, a clear and warm summer day. Here, the sound of distant trains going back into the city served as a backdrop together with overhead airplanes. As we are sitting on a small grass patch by a large pond, ducks, swans and coots suddenly notice us, expecting some food. We gave them some tiny pieces of bread. The swans took over and started to fight. After a long track we end up by Regents Canal and The Kingsland Basin Redevelopment site. Twenty four seven doesn’t exist here. It’s a microclimate of nuances and the personal mind of getting up early to make some recordings. A microphone is both a lark and a night owl.